I’ve been meaning to make bone broth for the longest time. Why you ask? Well, for one, it’s really really good for you. It’s full of collagen and gelatin which is great for healing the lining of your gut, boosting your skin’s appearance, helps with detoxification and also helps give your immune system a boost. Two, it’s really easy and much cheaper to make at home, and actually pretty quick if you have an Instant Pot. I was on the fence about the Instant Pot, but then Shaheen convinced me during Prime Day to buy it, so I did and I’ve been so happy with my purchase! I’ve used it to make rice, which comes out perfectly every single time, bolognese, and most recently bone broth! Typically bone broth simmers for hours and hours, like 24-48 to slowly pull out all the good stuff from the bones. But, honestly, who has time for that? Technically I could leave it on my stove top, but it does make me a little nervous. The Instant Pot is a pressure cooker, so it speeds up cook time considerably. All you need is beef (or chicken or pork) bones, and scraps from carrots, celery and onion. I have a big freezer bag that I toss all kinds of ends and leftover bits from these veggies. Then when it comes time to make bone broth, I just add equal-ish amounts into my pot with my bones, a few aromatic herbs, salt and peppercorns and let it go! P.S. 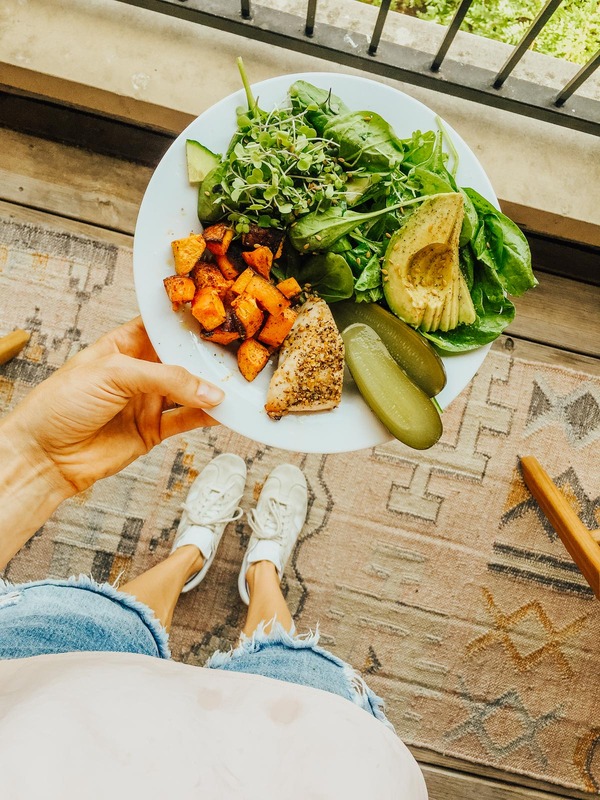 If you need some easy and healthy weeknight meals, I created a meal plan + a grocery list to make life a little bit easier! Sign up below to get them! Get my FREE meal plans! Sign up and get easy meals you can make during the week + a grocery list for easy shopping! As it gets colder, this is ideal for having in your fridge or freezer. When you start feeling sick or just want a little boost, just heat it up and drink it up! You can make soup with it, or just drink it straight out of a mug, which is what I do most nights or for a warm afternoon snack. You can add different spices to it for a different flavor if you like too—try cayenne, paprika or turmeric! I actually wrote a post on all the benefits of bone broth here, so if you’re not sure if it’s worth the effort, this might convince you! For the veggies, I use scraps of these that I keep in the freezer and exact measurements aren’t necessary, but in case you’re buying everything fresh for bone broth, here’s a simple list and average amounts of each item! Put all the ingredients through peppercorns into your Instant Pot. Add water up until about 1/2 inch below the max fill line. Cover and seal the vent. Hit ‘Manual’ and add 120 minutes to the timer. I was a little hesitant that this wouldn’t be long enough, but it made very flavorful, golden broth. In the future I’m going to try doing it for 4 hours, so 240 minutes, to see if it makes a big difference. Enjoy guys, and let me know if you make it!! BTW, 6 gut-healing tips to boost your health, and a week of free healthy meal plans.